« Our Girls’ Football Team were recently involved in a Rotherham United Community Tournament. 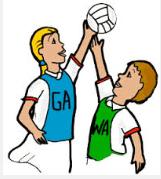 A group of 9 children Y6/Y5 children went to the Institute of Sport to compete in the Rotherham Netball Finals yesterday. They played 7 matches during the competition and were on a winning streak until they played the eventual winners. Having beaten 5 of the other teams and drawing their final match meant they achieved 2ndplace overall. The rules for this competition meant that the children had to rotate positions – 1 game they might have been shooting, the next they might be playing goalkeeper. There was some fantastic shooting with the team scoring 8 goals in 3 matches; two of those matches were an amazing 8 – 0 result! Hanzalah was presented with a ‘Self Belief’ award as during 1 match they were losing 2-1 at half time but he then scored 4 goals to give the team an 8 – 2 win by the final whistle.